For the last few years, I have done a brief post on my reading habits over the previous 12 months, and highlighted some of the best books I came across. You can find posts for 2016 and 2017, but here is my (belated) 2018 year of books! In 2017 I managed to read 32 books, which was much improved from the previous year. However, I ended up on just 25 this year. In January I decided that instead of counting books I would try to read 10,000 pages - the thinking being that when you are tracking the number of books it’s easy to rack up the numbers with many shorter ones instead of tackling the 600 page monsters that you keep meaning to get around to. By setting out to read 10,000 pages I gave myself permission to read fewer books overall while still having a big target to aim for. However, what’s actually happened is that I finished 25 books totaling around 6,000 pages, but with an additional 7 (mostly very large) books I am part way through. It’s quite likely that I did read a total of more than 10,000 pages, but since I’m only counting completed books it’s hard to say for sure. I think one of the unforeseen problems with large books is that they are heavy to carry around so you reduce the opportunities you have to make progress. Plus there are more chances that you’ll come across something else new and exciting while you’re working your way through and end up putting off coming back to it. Nevertheless, I read some really fascinating books in 2018, you can see the full list at the bottom of this post. Before I pick the top few, here are the stats on ratings in 2018. Here’s how my rating percentages have changed over the last three years. 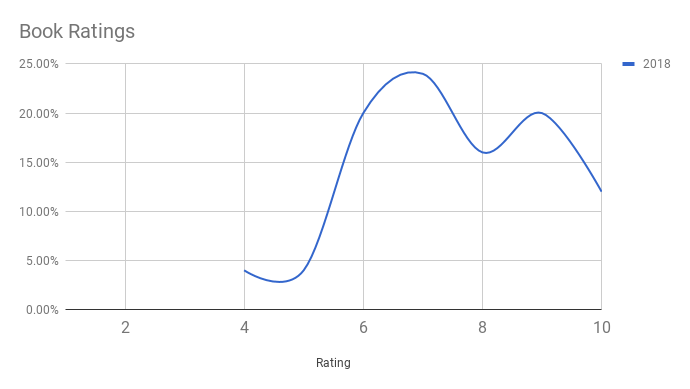 As you can see from the graph, over the years my most frequently chosen rating has shifted from 9, to 8, and now to 7 out of 10. Could it be that I’m becoming more harsh in my ratings? Maybe, but I think also it’s because it often feels like 8 out of 10 is a ‘default’ rating - good not great. When I feel like giving something an 8, I usually second guess myself and try to justify it as a 9 or a 7. I think that explains the weird ‘double hump’ shape. Perhaps a lesson for the coming year - sometimes an 8 out of 10 is just an 8! More positively, I read a greater proportion of 10s than in the previous years. A good sign that even if I read fewer books, at least they were well chosen! This is one of those books I had been putting off for ages because it was over 600 pages and looks like it would be a bit of a slog. In fact it was incredibly readable and one of the best things I’ve read in years. The big question it answers is why it is that Britain, France, USA and other western societies came to dominate the world and not the other way around? Why didn’t China colonise Africa and the Americas, rather than a tiny island off the coast of Western Europe? To explain, Morris takes us on a guided tour of human history from the dawn of civilisation to the 20th Century. While some have attempted to explain Western dominance by claiming superior genetics or psychological traits, Morris makes a convincing argument that Homo Sapiens are largely the same and that both Eastern and Western civilisations have gone through roughly the same phases of civilisation, just not at the same times. Although ultimately Morris argues that the geography of the West made it more likely to become dominant, it’s very clear that it might well have been different. There have been periods in history where the Chinese were the most advanced civilisation in the World - and there’s nothing inherent about the West, or Western people, that predetermined the outcome. An obvious claim, perhaps to most of us today, but not one that has always been widely believed until recent decades. This book walks you step by step through all of human history to demonstrate how we ended up where we are. A 100% recommended read, and a great reminder of Yuval Harari’s point that the value of studying History is to remind yourself that those things that seem fixed and pre-determined today, are rarely so. Sometimes the best books are those that cause you to completely change your mind on a topic. Naronomics was one of those books for me. Similar to the Freakonomics series, Wainwright uses an economic / business lens to analyse an unusual topic - in this case the worldwide illegal drugs ecosystem. He shows that most of the high profile attempts by governments around the world to tackle the drugs problem have been a waste of time at best, and in some cases actively counter productive. For instance, governments have spent millions trying to shut down the supply chain of cocaine dealers in South America by burning farms that grow the raw materials. In fact, the raw materials are extremely cheap and so even if you were to triple the price of the coca leaves, this would barely increase the price to the end user in London or New York. All you achieve is to make poor farmers even poorer. Overall it’s a great lesson that the best way to impact behaviour is to really understand the systems and incentives that encourage that behaviour. Wainwright does an excellent job covering all aspects of the drugs ‘business’ - from the importance of good PR, to supply chain economics, to the importance of good customer service for online dealers. Strongly recommend that you check it out. Amazing book. Actually the story itself is good, but not book length good. You could probably retell the story in a long blog post. What makes the book so great is Ryan Holiday’s telling of it. How he weaves in quotes and anecdotes from philosophers and thinkers from Ancient Greece through to 20th Century oil tycoons. The actual story is about how billionaire investor Peter Thiel secretly funded a lawsuit by Hulk Hogan to bring down gossip website Gawker. It’s a great lesson about how those who think strategically and plan carefully can achieve what is regarded as impossible by others. In addition, there’s an uncomfortable clash between “Hogan wins law suit after gratuitous privacy violation” and “Billionaire secretly funnels law suits to bring down website he doesn’t like” which isn’t easy to sit with. Like all great stories, it’s a case where all parties involved are a mixture of right and wrong. Gawker was undeniably offensive and had no respect for anyone’s privacy, but weren’t they just expressing their freedom of speech? We’re glad that Hogan got some justice in the end, but he’s also in this situation for sleeping with his best friend’s wife (and was caught saying some racist things). Thiel was also legitimately wronged by Gawker, but are we okay with billionaires using their money and power to secretly take down websites they don’t like? It made me laugh and cry in equal measure. Wonderful autobiography by one of my favourite people. When I visited Zanzibar in September, I didn’t realise that it had been at the centre of the East African slave trade, well into the 19th Century. Really fascinating story about how it was brought to an end. A very short book, but plenty of philosophical ideas to reflect on. Voltaire wrote this as a satirical response to those who claimed that we live in the best of all possible worlds. In 2019 instead of setting a target for number of books to read, I’ve decided to put a greater emphasis on the authors I choose to read. To make sure I’m reading widely, I’ve decided that 50% of the books I read in 2019 must be written by a woman and/or a non-white author. Update to follow at the end of the year. Here’s the full list of books I read in 2018, and the rating I gave for each one.